Excellent quality of the music, with an impeccable interplay. The musical progressions created by this trio can hardly be explained by intuition alone. 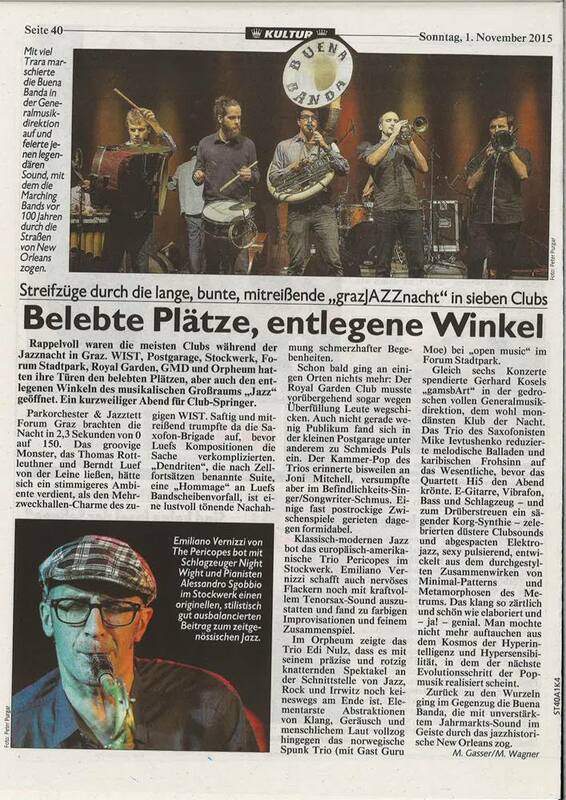 Their songs convey complex, repetitive patterns and raw playfulness, which sounds like swapping the Swiss Nik Bärtsch with the Americans of The Bad Plus, and throwing them into a particle accelerator. An intellectual fun. Insistent motifs, ostinato and complex rhythms. Definitely own and demanding. The listeners of this dazzling album will be rewarded with a discovering journey of exotic listening rooms of their own inner worlds. Legacy is an original, stylistically interesting contribution to European jazz. Focusing on a grooving, sometimes staccato-like rhythm, the pieces are structured neatly and still show a lot of improvisational fun. 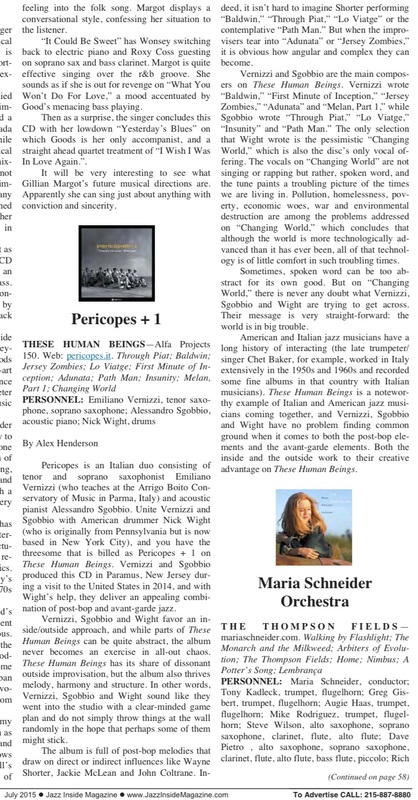 Wight sends Pericopes towards a new direction, more accessible to the public, while the music remains layered and has depth. This trio perfectly matches the trend of today’s jazz: solid music to keep reflecting on. You really need to check out this new release from Pericopes. Adding Nick Wight to the fold gives the affair a much more lively and excitable demeanor. The thrilling rhythmic curls of title-track Legacy, and how they suddenly break into stretches of insistent pulsing tempo certainly add to the reasons why this album is so damn enjoyable. Pericopes + 1 return with a new edge to their sound. Well-crafted post-bop tunes, highly recommended. An incomparable sense for rhythms and harmonies, a unique musicality which leaves the listener so speechless and breathless. A pure pleasure! A balanced collection of chamber music cabinet pieces, between introspection and avant-garde. Quiet intimacy and sensitive listening. What What is an exciting saxophone-piano record, a good example of unspoiled agility. What What possesses a solemn tone reminiscent of a chamber jazz session recorded in an old church somewhere out in the countryside. It’s a tone that carries even through those moments when the duo jacks up the heat several notches… as they frequently do on this lovely recording. The tides of intensity shift to and from with a suddenness that is often quite stunning. 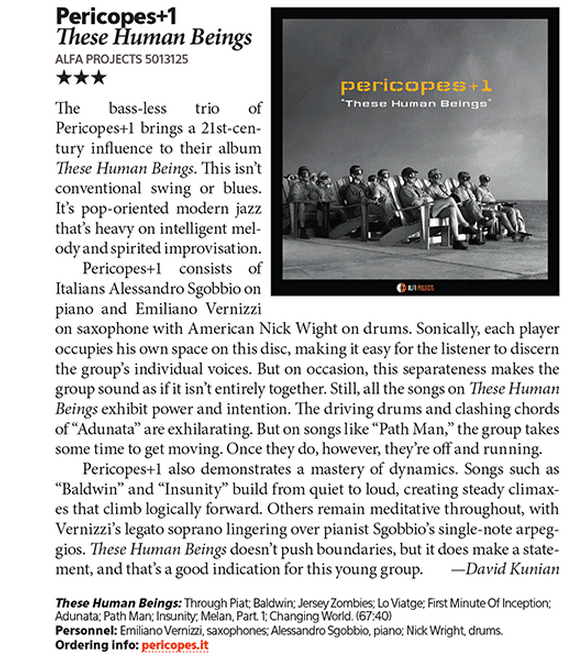 The bass-less trio of Pericopes+1 brings a 21st-century influence to their album These Human Beings. It’s modern jazz that’s heavy on intelligent melody and spirited improvisation. All the songs exhibit power and intention. Pericopes+1 also demonstrates a mastery of dynamics, creating steady climaxes that climb logically forward. These Human Beings does make a statement, and that’s a good indication for this young group. Pericopes + 1 enters the American market with These Human Beings with the “+1″ representing the addition of New York based drummer Nick Wight. The varied program, musical interactions and progressive thinking behind it are likely to generate interest on this side of the Atlantic. The Greek definition of pericope is a set of verses that forms one coherent unit or thought. Vernizzi, Sgobbio and Wight fit that definition perfectly, making These Human Beings is an impressive outing. 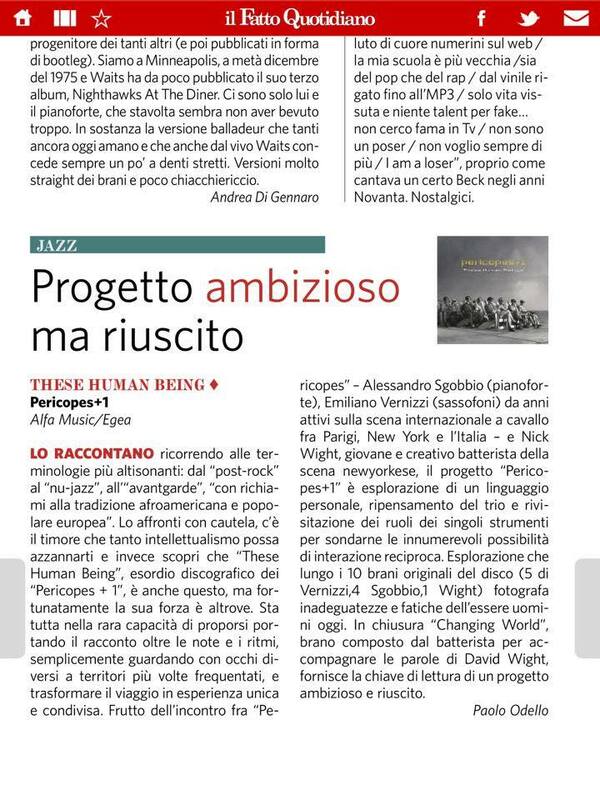 These Human Beings is a noteworthy example of Italian and American jazz musicians coming together, and Vernizzi, Sgobbio and Wight have no problem finding common ground when it comes to both the post-bop elements and the avant-garde elements. Both the inside and the outside work to their creative advantage on These Human Beings. The group’s most impressive feat is that its ambitions don’t get in the way of the music’s accessibility. They play with intelligence and heart throughout, yet for all the complexity, the group is capable of communicating emotional depth through relatively structures. Without a bassist, Sgobbio does an impressive job locking his left hand figures with Wight’s grooves, creating the impression of a bottom. The trio music on this album is well grounded. The choice for adding a drummer is a good move. Plenty of expressiveness from this duo + 1 set from saxophonist Emiliano Vernizzi, pianist Alessandro Sgobbio and drummer Nick Wight. The shifting between the two states of volatility and solemnity go along way to binding the album up into something exciting and satisfying. Wight provides a solid ticking pulse to the pieces, with cymbals picking up and emphasizing the phrases that Vernizzi plays. 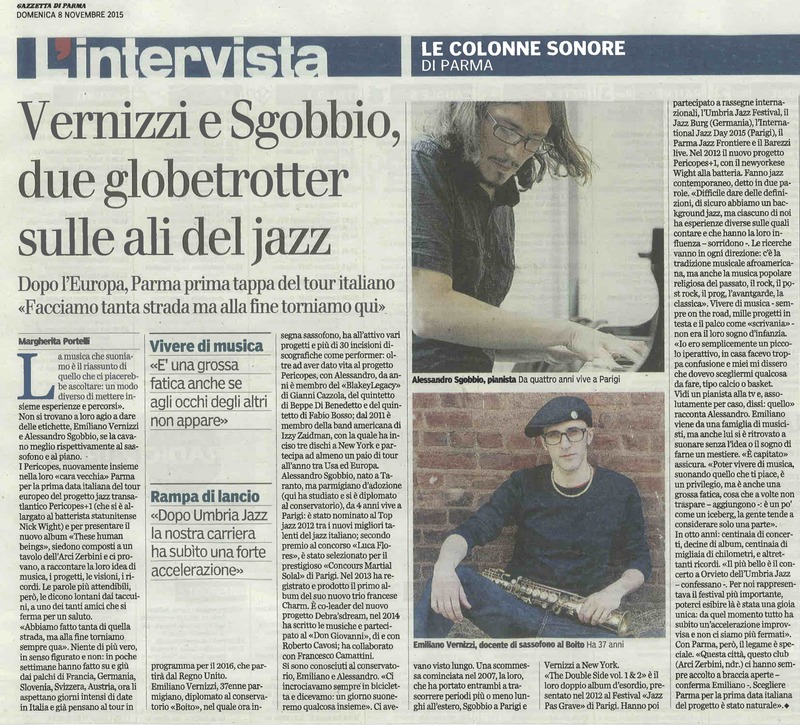 The mix of drums and the low notes of Sgobbio’s playing maintain an insistent and steady beat through each of the pieces. The unity of the trio, even when the rhythm becomes most disrupted, is crisp and clean. The big strength of this album is its rare ability to tell us a story which goes further than the notes and the rhythms, transforming this journey in a unique and shared experience. An ambitious and successful project. 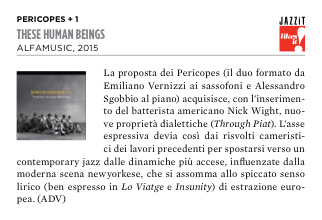 Pericopes duo experiments a new dimension with the addition of Mr. Wight. The trio works perfectly. This new album These Human Beings is an authentic surprise. A high level, personal and inspiring album. The musicians do not expire in repetition… In addition, this experiment is not shunned, so the music continues to fascinate from beginning to end. The choice of a drummer was a good move. The trio music on this album has both feet on the ground. 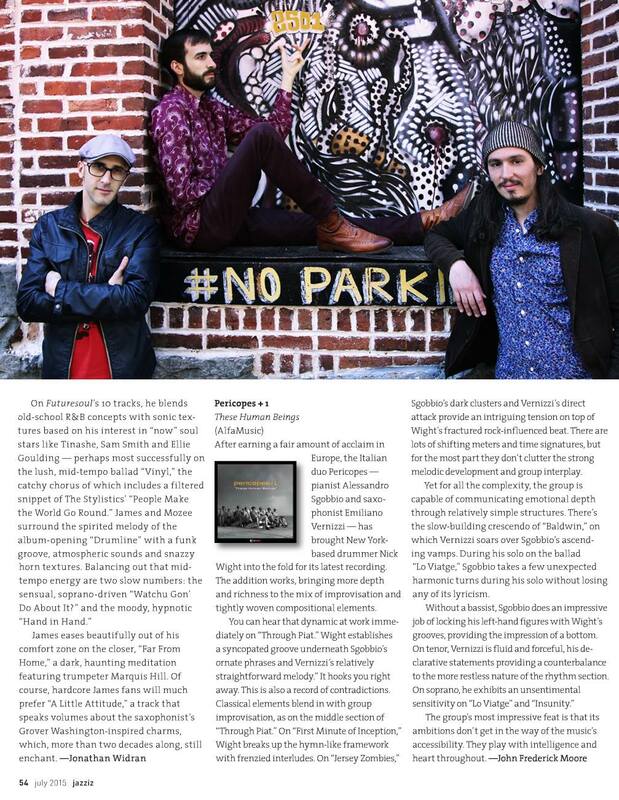 The proposal and addition of American drummer Nick Wight gives the Pericopes duo new dialectic properties (Through Piat), creating a contemporary jazz that mixes influences from the NYC modern jazz scene with a strong sense of lyricism – a landmark of the European tradition. The attention to the sound is absolute. Every listening reveals new fine shapes and details that the sobriety of Pericopes’s poetics don’t show immediately. With the intervention of a valuable drummer, which fits dialectically and not as a simple support, the duo’s music acquires a new dimension, which enriches its already considerable strengths. 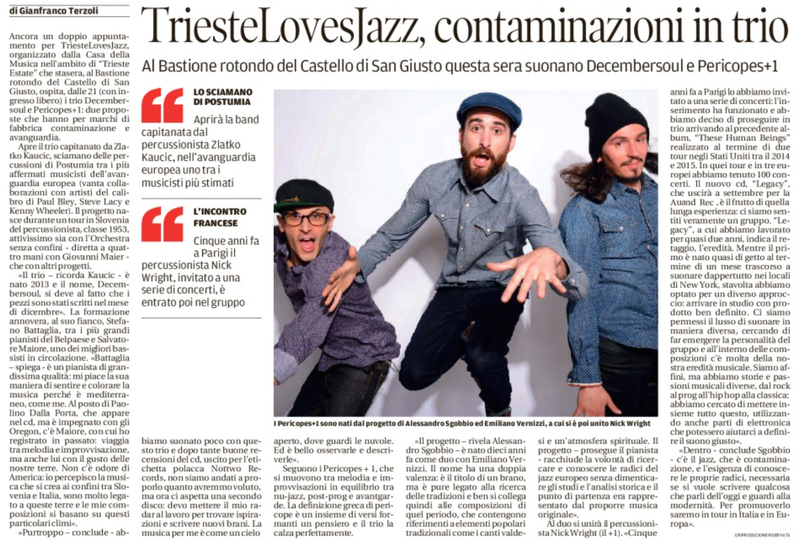 Enjoyable the peculiarity of the trio, which gives an energetic and personal music, influenced by the NYC contemporary jazz scene and the re-use of popular melodic cells, with references to European sounds. Pericopes+1 search and find various ways of interplay. They create a music with plenty of personality and energy. Pericopes+1 is a modern masterwork. An intense and energetic music full of youthful freshness and lightness. Highly recommended !!! A nice surprise which goes further than just a very well played album with fine solos. Here these three musicians take out uncommon and unused ideas, settings and suggestions, carrying the listener in some unexplored territories. You can really walk towards each step of this album, feeling the physical pleasure of the discovery. The open nature of this project puts on board drummer Nick Wight, that worth “+1″ who is the main character on final song “Changing World”, a nostalgic paint which gets the emotional highlight of a courageous and unpredicted album. These three artists engage in a dialogue with plenty of sonorous effervescence and evanescence. They ask and answer each other; then they go together or they take opposite ways; sometimes they agree, sometimes they disagree, competing around harmonic and rhythmical stuffs. They play together a cerebral music by keeping their whole spontaneous sensibility intact. Pericopes + 1 fits their era perfectly: These Human Beings is a rich cocktail of unpredictable moments, where musicality and strength merge together with a colorful homogeneity. These Human Beings is plenty of artistic humus. The good thing about this trio is that they don’t “hang out” with either the omnipresent neo-bop, nor the ecstatic Scandinavian style. In their composite rhythms we can find a particular experimental, fragmented and multi-directional rock. The distribution of the rules is well balanced and it gives a sense of unity to the improvisations. Very dynamic and progressive songwriting that leaves spaces for playful and melodic outings. ‘It is a crazy world, a crazy changing world’, according to the poem in the closing song ‘Changing world’. The music of this international trio is played with decisiveness. This 10-track album from Pericopes+1 conduct the listener into a sonore dimension where the dialogue and the conceptual revision of interpreting rules will make the jazz of tomorrow. The newer pieces the trio performs clearly demonstrate another step forward. This trio has impressed us with richness of ideas, unity of sound, linear thinking, consequential exposure. 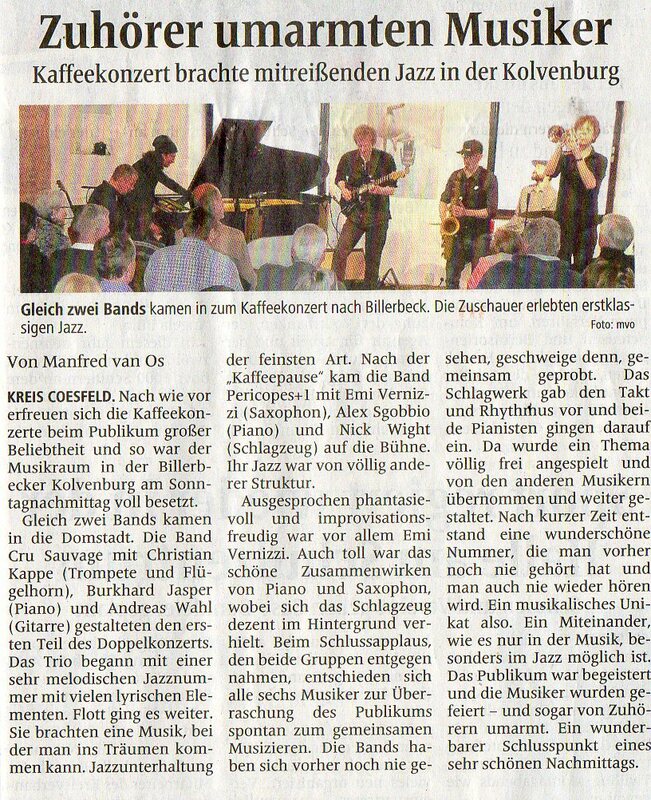 Classic contemporary jazz stage Stockwerk welcomed the European-American trio Pericopes +1, creating fine improvisations and interplay. An original, stylish contribution to contemporary jazz. Pericopes+1 is definitively one of the contemporary bands you must discover! Pericopes + 1 @ The Globe, Newcastle. The oft-quoted Sound of Surprise has, surely, never been more appropriate than with this band. Certainly, their important roots catch the listener’s attention. Their music suggests also a special open-mind spirit and a depth of the horizons. Those young artists, free of prejudices and ideologies, are creating the music of tomorrow.